Tea lovers from far and wide are sure to love this selection of delicious experiences. From bubbles and fizz to utterly mad Hatter’s parties, there’s a tasty tea-based venture perfect for everyone, no matter their palette, personality or passion for flavour. Whether they choose to enjoy an afternoon tea within a historic hall fit for royalty, complement views of the South West coast with a quintessentially Cornish scone, or celebrate all things vintage with a retro treat, they are sure to leave with their taste buds utterly treated. Although this collection of experiences and venues within this package are wonderfully different from one another, they all have the offering of moreish scones, cakes, sandwiches and of course, expertly brewed tea in common. Travel somewhere completely new or revisit a favourite spot to celebrate the nation’s favourite beverage and much, much more! This is a chance for a pair who enjoy the finer things in life to really push the boat out and enjoy a meal that has its origins in upper echelons of society, all of which are brought to life in these elegant surroundings. Choose to enjoy in either the rolling countryside of Herefordshire from the comfort of a Georgian mansion, or in the vibrant west end of Scotland’s capital, Edinburgh. This experience is an ideal treat for a couple who need a chance to get away from their daily routine, friends who don’t get to see as much of each other as they would like, or any pair who want to spend some time together and prefer to do it in style. This afternoon tea experience has everything one would expect in a meal that is designed to be refined. The menu includes everything one would expect from a traditional afternoon tea, including delicate finger sandwiches such as; egg and cress, ham and of course salmon and cucumber as well as freshly baked cakes and scones with clotted cream and a selection of preserves. The delicious food will all be accompanied by a choice of tea and coffee. This experience will last approximately 1 to 2 hours. Hotel Penzance is an elegant 4* townhouse set in an Edwardian building, with views across the harbour and Mounts Bay. Five minutes from the centre of town, it is the ideal place for afternoon tea before taking a walk along the sea front and exploring the town’s iconic landmarks. This experience is for two. There is no minimum age for this experience, however under 16s need to be accompanied. 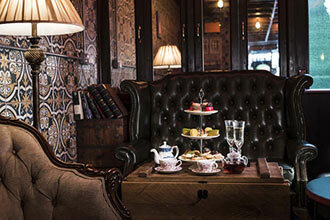 Celebrate a quintessentially British past-time with a spot of Afternoon Tea for Two. 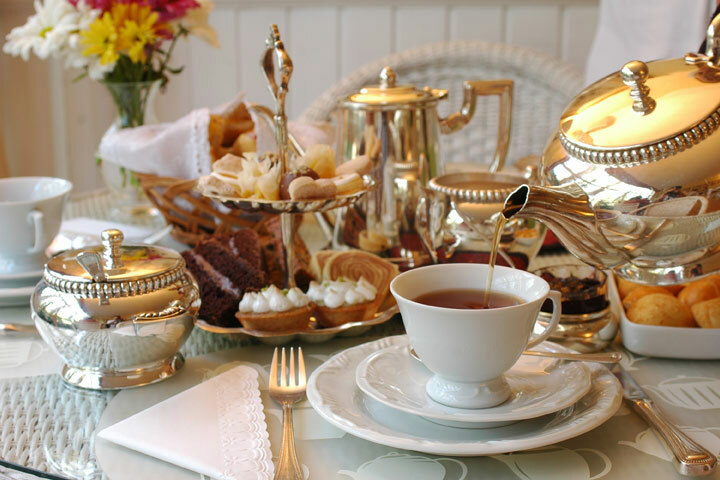 Afternoon tea has been a British institution since Anna Maria Russell - the seventh Duchess of Bedford - asked her footman to bring her a pot of tea with light refreshment one afternoon in 1840. The ritual caught on and afternoon tea became the corner stone of high society dining. These days taking tea as a light afternoon meal has become much more accessible, without losing a crumb of its wonderful charm. 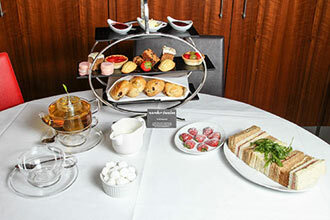 Enjoy Afternoon Tea for two with a glass of bubbly each in the friendly and bustling tea room. Please note that under 18s can enjoy a milkshake substitute. You will be welcomed by the friendly staff at The Lyndhurst Tea House where you will be seated and served an afternoon tea accompanied by a glass of prosecco each. You will l typically be served a choice of large handmade scones, served with clotted cream and jam, accompanied by a selection of cakes, freshly prepared sandwiches or homemade puddings such as Bakewell Tart or Jam Roly Poly served with lashings of custard. Please note that menus can vary throughout the year. This experience is available Monday to Sunday, throughout the year, subject to availability, excluding Christmas & Boxing Day. This experience is for you and a friend to enjoy, and there will be other customers at the venue at the time of your visit. There is no minimum age. Under 16 year olds must be accompanied by an adult. This wonderful afternoon tea treat is the perfect way to celebrate traditional British culture in style. Orestone Manor is a magnificent Georgian manor house set in the picturesque South Devon coastal village of Maidencombe, with spectacular sea views over Lyme Bay and beyond. Awarded two AA rosettes, Orestone Manor has a warm and inviting ambience and is the perfect setting to enjoy afternoon tea with a friend or loved one. On arrival you and your friend will be greeted and shown to your table. You can enjoy your afternoon tea on the sun terrace, with sea and garden views; in their bright and airy conservatory or in the bar by roaring log fires. 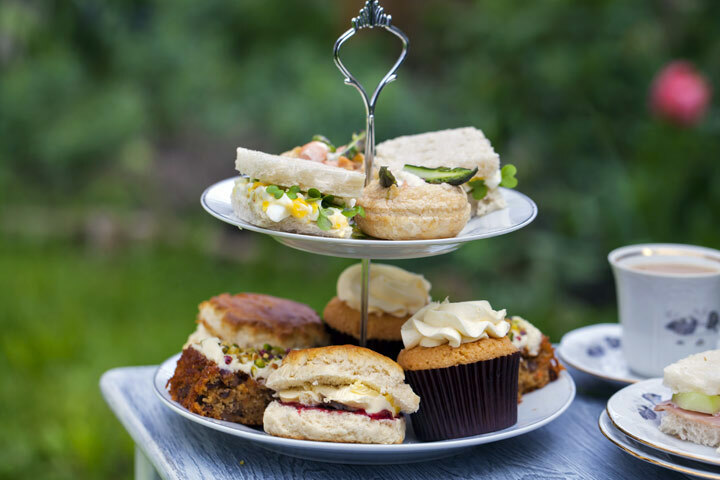 Sit back and relax amongst the beautiful surroundings and indulge in a selection of fresh finger sandwiches, a homemade scone with Orestone preserve and Devon clotted cream and homemade cakes - all served with a variety of refreshing teas to choose from. If there’s anything better than enjoying the luxury that is an afternoon tea, then doing so in a tea room which encapsulates the very essence of this popular tradition is just the thing! The Grade II listed building, which dates back to the 14th Century, is even older than the idea of afternoon tea itself, and the sandstone walls and exposed beams would already have been period features when the Duchess of Bedford was pioneering her gatherings of friends for sandwiches and cake between meals. This afternoon tea experience is a chance to sample a taste of the high life with just a touch of wanton extravagance thrown in. It’s a perfect experience for anyone using this as a chance to recharge their batteries after a morning exploring Chester, whether they’ve been seeing the sights or just doing a little shopping in the vibrant town centre. This afternoon tea has just the right balance of savoury sandwiches and freshly baked cakes to make it feel like a deliciously indulgent way to spend an afternoon. Guests will enjoy unlimited tea or coffee to accompany their selection of finger sandwiches and fruit scones which are served with butter, jam and Rhodda’s traditional Cornish clotted cream with freshly sliced strawberries. There is also a choice of cakes all made from the freshest ingredients which make these mouth-watering morsels truly tempting. With such an array of dainty delicacies and a selection of sweet treats, the addition of a glass of bubbly makes this the perfect way to enjoy a refined celebration or just a chance to spend some quality time together. This experience is available Monday to Sunday subject to availability, This experience is available throughout the year. The minimum age for this experienece is 18 years old. Nestled in between magnificent landscaped gardens and enchanting woodland, Farington Lodge is a charming 4-star, grade II listed Georgian house which blends lavish period splendour with the very best in contemporary luxury. Sitting in a quiet rural spot with rolling Lancashire countryside beyond, Farington Lodge is an ideal base for taking a scenic stroll after enjoying a deluxe afternoon tea with a friend or loved one. Sit back and relax amongst the beautiful surroundings and indulge in a selection of fresh sandwiches, homemade scones and cakes - all served with a variety of refreshing teas to choose from. 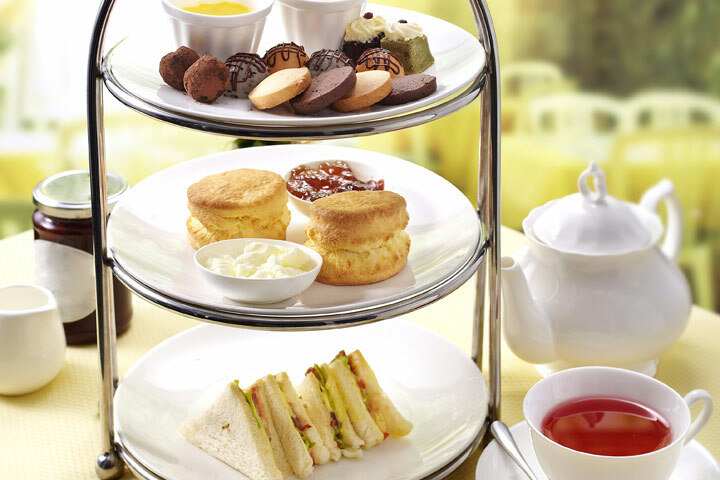 Upon arrival you will be greeted by your server before being seated and served your afternoon tea. Any additional food or drinks can be purchased on the day. There are no qualification requirements. 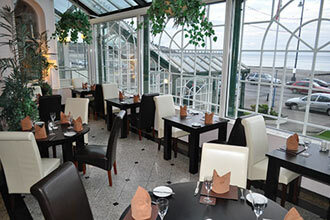 The Empress Hotel is situated in a beautiful setting overlooking the open seaside on the picturesque Isle of Man. You will be able to enjoy sea views all year round, making it a great location to indulge in a Deluxe Afternoon Tea. On arrival you will be greeted by friendly staff who will seat you in the Piano Bar lounge area, conservatory or even on the outside sea facing tables (weather permitting). Your afternoon tea will consist of a selection of freshly made sandwiches which include prawn marie rose, roast ham and English mustard, cheddar cheese and homemade chutney or smoked salmon and cucumber, all accompanied by salmon pin wheels. You will also enjoy a delicious selection of sweets, including warm homemade scones, clotted cream and jam as well as warm chocolate fondue with fresh fruit and marshmallow dip. This will all be accompanied by a selection of speciality teas and coffees. Generally you will spend an hour at the venue, however there is no set time. There is no minimum age, under 16s must be accompanied by an adult. This Victorian country house is tucked away in seven acres of secluded grounds in the charming village of Burnham in Buckinghamshire. Originally the country retreat of famous UK brewer, John Fuller, Grovefield House Hotel blends country house elegance and modern luxury and is a fantastic place to enjoy a deluxe afternoon tea with a friend or loved one. Relax in peaceful surroundings and indulge in a selection of fresh sandwiches, homemade scones and cakes - all served with a variety of refreshing teas to choose from. Situated in the quiet beauty of rural Shropshire, The Haughton Hall has been decorated with timeless style and is situated in 35 acres of beautiful gardens, woodland and lake. Haughton Hall extends a warm welcome to all guests and is the perfect location to enjoy an afternoon tea. On arrival you will be greeted by friendly staff who will seat you in the tastefully furnished lounge. Situated in 7 acres of beautiful and serene Sussex countryside, The Hickstead Hotel is the perfect setting for a country escape and is a great base to explore this idyllic rural county being so conveniently located near some of the best sightseeing locations in Sussex. The Hickstead Hotel is a fantastic place to enjoy a deluxe afternoon tea with a friend or loved one. Surrounded by pretty lawns and peaceful gardens, The Old Swan Hotel is a charming hotel and restaurant situated close to the heart of Harrogate. Steeped in almost 200 years of history, the hotel is famous for being the secret hideout for British crime-writing icon, Agatha Christie, when in 1926 she famously disappeared for 11 days, resulting in wide-spread public furore. From its revolving front doors to the elegant glass ceiling in the Wedgwood restaurant, The Old Swan is a fantastic place to enjoy a deluxe afternoon tea with a friend or loved one. Sit back and relax amongst the beautiful surroundings and indulge in a selection of dainty finger sandwiches including smoked salmon and cream cheese, ham, tomato and mustard, cheddar and sweet pickle and coronation chicken. Followed with a selection of sweet treats such as homemade fruit scones with strawberry preserve and clotted cream and a variety of homemade cakes, all served with a variety of refreshing teas to choose from. In the heart of the historic market town of Alnwick and only a stone’s throw from Alnwick Castle and Gardens, sits The White Swan Hotel, a charming 300 year old coaching inn, rich in history and enchanting from the moment you enter. The hotels most distinguishing feature is the Olympic Suite - a large room furnished with interior features salvaged from the RMS Olympic - the sister ship of the world famous Titanic. This grade II listed building is a fantastic place to enjoy a deluxe afternoon tea with a friend or loved one. After your tea you will be perfectly positioned to discover the local attractions including Holy Island and Lindisfarne and Northumberland National Park. Your afternoon tea can be enjoyed in the restaurant, lounge, conservatory or gardens. Whether you want to celebrate a special occasion or to simply treat yourself the Grove Cromer have designed their afternoon tea menu to allow guests to really indulge. Their new flowering Jasmine afternoon tea is a lovely variation on their traditional afternoon tea. Featuring a very light and fruity Tea with a special ‘jasmine Pod’, which unfurls in your tea glass to become a beautiful scented flower. A pot of English breakfast tea can be added at no extra cost, if required. You will also be treated to their afternoon tea menu, which will include savoury finger sandwiches, freshly baked scones with homemade preserves and clotted cream and a selection of traditional, fruit and herbal tea. 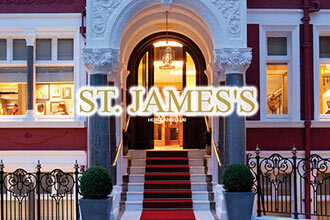 You will also receive 20% off your next booking with this voucher. This experience is available Monday to Saturday, throughout the year. Excluding Bank Holidays. This experience will last approximately 1-2 hours. Under 16 year olds must be accompanied by an adult. The concept of a cream tea has been established for centuries, with the earliest mentions the practice of eating bread with cream and jam dating back to Tavistock in Devon in the 11th Century. A recent resurgence has seen people embracing a taste of decadence in the middle of the afternoon and the cream tea has spread beyond its West Country origins with tea rooms and cafés all over the country offering visitors a taste of this tradition. In a café that is within easy reach of Bath Abbey, the array of homemade food provides guests with a delicious way to take some time out from their day to appreciate the care and attention that the chefs put into their work. This experience for two is the perfect way to relax after a day’s sightseeing in the beautiful city of Bath. The café itself is popular amongst locals and visitors alike and they have earned a reputation for excellence over the past three decades. The Courtyard Café have turned the idea of a cream tea on its head by adding their own unique twist in the form of a Bath Rarebit, a deliciously indulgent take on cheese on toast that is the perfect way to prepare the taste buds for two homemade scone with cream and jam each that follow. This feast is accompanied by an individual pot of tea each, or a freshly brewed coffee, making this a truly delicious way to spend an afternoon. What better way to enjoy an afternoon tea than in the town of where Downton Abbey is homed. You will be greeted by the lovely staff at Essborne Manor Hotel where you will be given the chance to dine in either the library, bar or lounge. Enjoy a selection of delicious open sandwiches, fluffy scones, indulgent cakes and mousse and of course a pot of tea or coffee. There is no minimum age for this experience, under 18s must be accompanied by an adult. This Vintage Tea for Two takes the best parts, Scones, Cakes and Tea, of the long-standing British tradition, afternoon tea and serves them up with the real focus on good old fashioned quality home baking. The unlimited tea, is served in vintage china teapots, cups and saucers and made with the guests choice from a large selection of premier loose leaf teas, including red bush, fruit and caffeine free tea. Guests can also choose freshly ground coffee should they wish. The Vintage Tea for Two stand includes two freshly home baked generous sized plain or sultana scones (with dairy and gluten free options available on request) served with lashings of Cream and Jam, along with a selection of home-baked cakes, including sponges, loaf cakes and tray bakes. This Vintage Tea for Two is sure to hit the spot and fear not, if guests aren’t able to finish the generous portions, take away boxes are provided. *Vegan, Dairy Free & Gluten Free options are often available please state any dietary requirements when booking. This experience is available Monday to Wednesday subject to availability, throughout the year. Under 16s will need to be accompanied by an adult.